It’s time to check that list again – you have your perfect wedding gown, you have something old, something new, something borrowed, something blue and a silver sixpence in your shoe. What is missing? What about your ‘do? 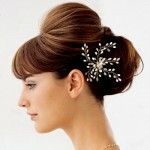 A vintage wedding hairstyle is good option for a formal or a classic-themed wedding. You will never go wrong with vintage curls or bob and a playful Deco-inspired bridal hair accessory. A sleek bouffant is very flexible if given the right hair accessories. 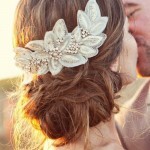 You can wear it with a tiara or head band if you have a formal or classic wedding. If you have a spring or outdoor wedding you can accessorize with flowers. You can never go wrong with a bun whether it’s braided, ballerina, or positioned above the nape. You can have your bun styled in various ways for different wedding themes. 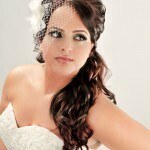 For medium and long haired brides, you can have your hair half up with romantic twists. Twists can go well with a beach, garden wedding or any wedding that infuses nature to its wedding elements. Whether it’s a sculpted or a sleek bob, having the right hairpieces is perfect for any wedding theme. Aside from choosing what hairstyle matches your perfect wedding gown and your wedding theme, you also have to take note what style highlights your facial assets. I would recommend visiting your hairdresser a month prior to your wedding date (or earlier) for a trial run. Have some ideas ready and start experimenting. If you plan on dying or highlighting your hair, do so at least a week and half before the weeding in case you have any mishaps.